October 18, 2018, marked the 12th annual EU Anti-Trafficking Day to raise awareness of the atrocities of human trafficking. 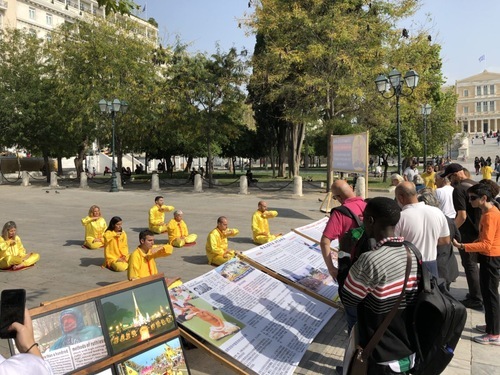 In conjunction with this important date, Falun Dafa practitioners in Greece held an event in Athens on October 20 to draw attention to the trafficking of vital organs taken from living Falun Dafa practitioners being persecuted by the Chinese communist regime. Falun Dafa (also called Falun Gong) is a traditional mind-body cultivation practice. It has been brutally suppressed by the Chinese Communist Party since 1999 in a campaign of persecution that amounts to genocide. Falun Dafa practitioners and other prisoners of conscience, including Tibetans, Christians, and Uighurs, have been targeted for their organs in extrajudicial killings sanctioned by the state. 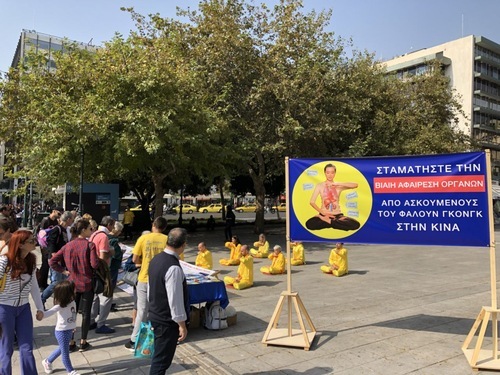 Falun Dafa practitioners in Greece demonstrating the exercises in front of the information stands. The Greek Ministry of Foreign Affairs encourages activities centered around the October 18 commemoration and supported the practitioners’ event. The event was held on Syntagma Square in the centre of Athens. Passersby were shocked to learn about the killing of Falun Dafa practitioners in China for their organs, and many had a hard time believing the brutality carried out in Chinese prisons. Practitioners told them about the investigations that have taken place and the non-governmental organisations working to stop these crimes. They also mentioned laws being enacted in European countries and around the world to ban involvement in organ trafficking in China. 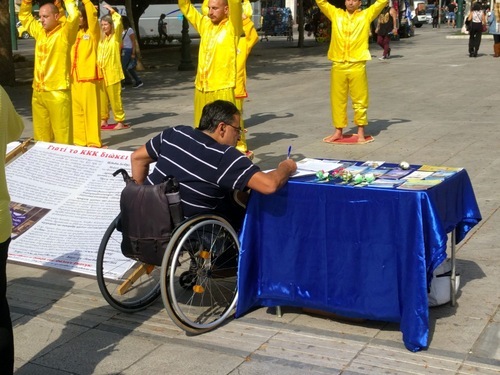 A man signs a petition calling on the Greek government to help stop the killing of Falun Dafa practitioners in China for their organs. People thanked practitioners for the information and signed a petition calling for the Greek government to take the initiative to ban participation in organ trafficking in China. Many people asked how to learn the Falun Dafa exercises. The Greeks have a close affinity to traditional Chinese culture, as both countries have long histories.